Well, it’s day 2 of the lobster extravaganza and I am going strong. My gorgeous Maine lobsters from OvernightLobster.com held up beautifully in the fridge after being cooked yesterday and so my mission to extend the lobster decadence as long as possible remains hopeful. Today, one stunning lobster tail made its way into a rich and creamy risotto (made even richer and creamier by a few spoonfuls of luxurious Italian mascarpone cheese) and served to prove one of my favorite budget cooking proverbs, which states that a little bit of an expensive ingredient can go a long way. This is absolutely not a side dish; this risotto is meant to be savored as a main course, perhaps after starting with a lemony green salad, and definitely followed by dessert. 1 cup raw Arborio rice $2 for 16 oz. 1/2 cup frozen green peas $1.50 for 10 oz. 3 tbsp mascarpone cheese, plus more for garnish $3 for 8 oz. Heat the olive oil over medium heat in a large pot. Add the shallots and cook for 1-2 minutes, or until soft and fragrant. Add the rice and allow to toast for 2-3 minutes, stirring occasionally to avoid scorching. Add the stock, 1/2 cup at a time, stirring occasionally to encourage absorption. Continue cooking until all the stock has been absorbed and the rice has become very creamy. 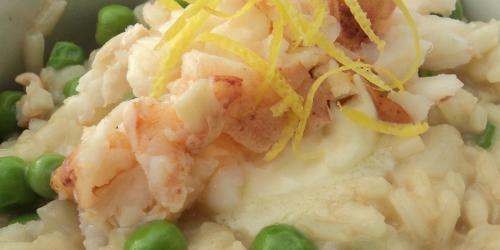 Stir in the peas, 3/4 of the chopped lobster meat, the lemon juice and salt and pepper to taste. Just before serving, gently stir in the mascarpone. To serve, divide the risotto into bowls and top each bowl with a small spoonful of mascarpone, a few pieces of lobster and a pinch of the lemon zest. I like freezing leftover cooked lobster to use for another time, like for an artichoke and lobster dip or seafood chowder. This looks yum! Can’t wait to make it AND your site is great! You give the wonderful recipe which is very mouth watering and this kind of the dish is so healthful for the people. You give some useful detail about this lobster information which is very authentic but you can write my essay custom writing to make your task excellent. You give almost every type of the information which is very wonderful. You give the wonderful recipe which is very mouth watering and this kind of the dish is so healthful for the people. You can make use of these guidelines or enroll in outlook or enroll in outlook. Anybody who has actually utilized a Microsoft account in the past could utilize. I will certainly see that you are a specialist at your control! I am driving an internet site rapidly. what’s even more, your records might be incredibly helpful for me. a lot of thanks to you for all your aid and wishing all of you of the achievement to your venture.